Today I’m going to talk about a tool which I use almost every day within my SEO life! I want to put the word out there because this thing has saved me countless hours and helped me to learn about Xpath and get a lot better with Excel. I also want to give people working examples of why this tool is great and what can be done with the tool. 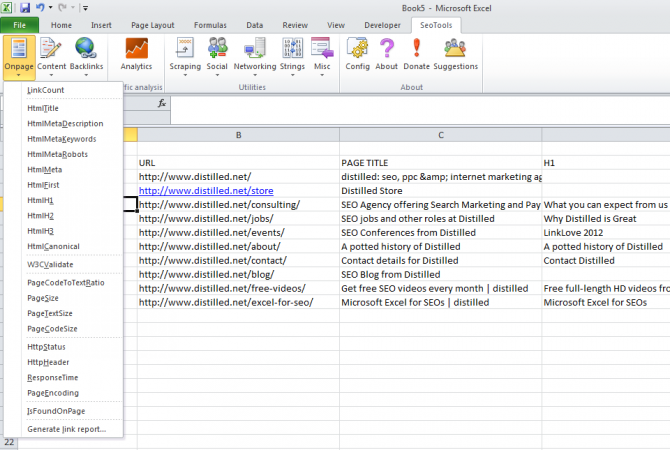 SeoTools for Excel is a great tool made by Niels Bosma, which runs as an add-on to Microsoft Excel and features some functions which are incredibly useful for everyday SEO tasks and allow you to grab information from websites, quickly and without even leaving Excel! To call a function you select them from the SeoTools menu and fill in the information needed or call the function from a selected cell and apply it to a URL. I am going to run through some tools and hacks of my own and from other people from across the internet for educational and demonstration purposes. This quick hack/tool lets you check a list of URLs to see if there are indexed in Google and makes use of the HttpStatus function to let you know what status code is being served for that URL. I have found this tool useful for checking the index ratio of a websites content (the amount of URLs indexed) and for quickly checking how much content of a sitemap is indexed. The tools works by running a site: command in Google for the URL you have entered and uses Excel functions to show whether that exact URL is returned as indexed or not. You can find this tool in the examples Excel sheet at the end of this post. My friend made this tool and posted in on the SeoTools for Excel forum you can download the ranking tool directly from the forum after signing up and it is also included in the example Excel sheet at the end of this post. 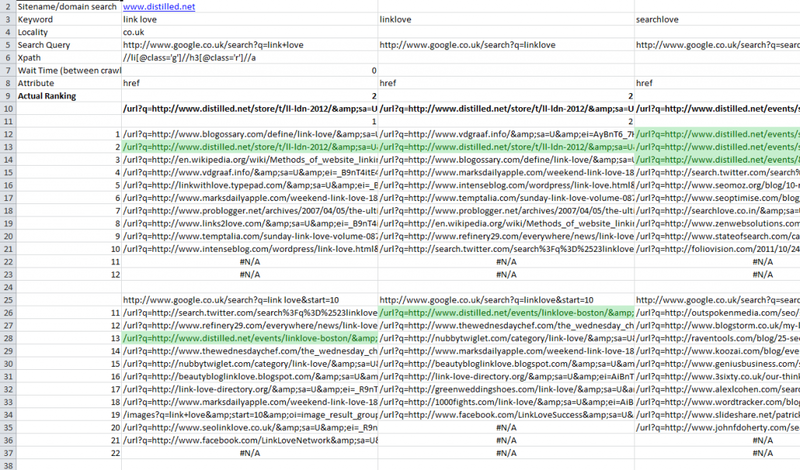 The tool checks current rankings in Google for keywords against the site name you declare. Although the rankings positions should be taken with a pinch of salt and you shouldn’t ping Google too many times for results (as requests will all be from your IP) this tool is very handy for quickly understanding which pages of your website are ranking. It is also great for getting an idea of the sites in the top 30 positions for keywords. 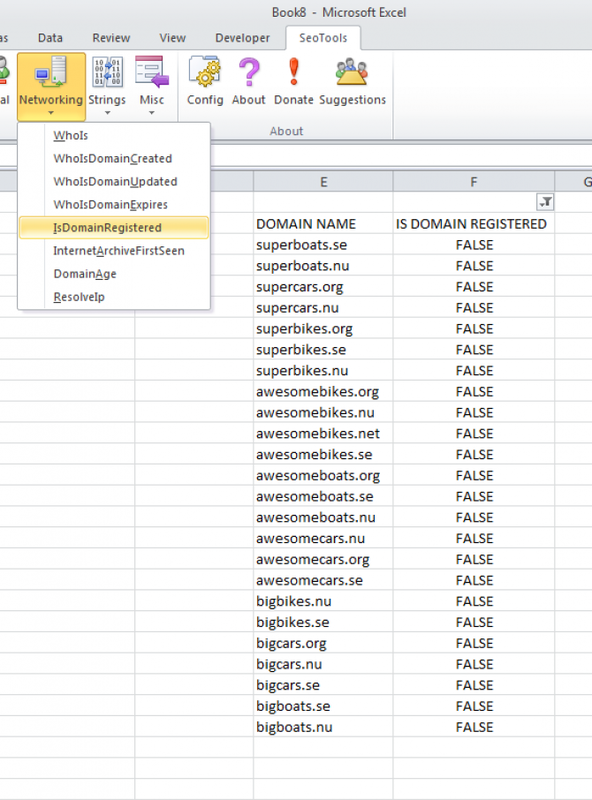 Also this tool is a great example of what is possible using Xpath, SeoTools for Excel and a little bit of Excel magic! Using the httpstatus function within SeoTools for Excel, you can quickly assess a 404 error list from Google Webmaster Tools. This is handy when you are working to remove 404 errors associated with your website as the results you see will be live, which means you can see results faster than waiting for Google Webmaster Tools to update. Niels also gave me a cool tip during the research for this blog post which is crazy useful if you are doing some domain name research. Using the following string will show you 45 possible combinations of domain names which you can then cross check with the IsDomainRegistered function to see if they are available! If you want to quickly get an understanding of a websites health and SEO set up but don’t have Google Webmaster Tools then SeoTools for Excel can be a great tool to grab meta information quickly. This is also handy for checking to see if changes have been implemented on a site during an SEO project. 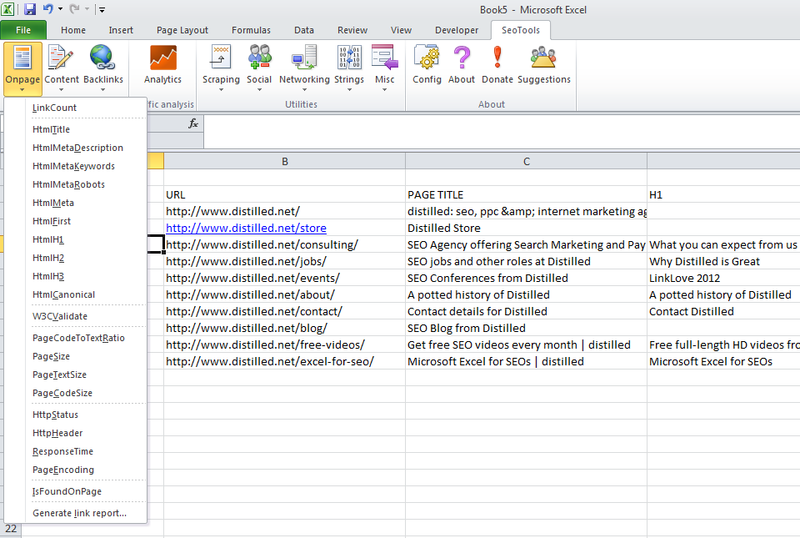 SeoTools for Excel can also be used to check if a link is live on a page, which is super useful for link building as you can quickly check a number of URLs to see if links are live and that rel=nofollow isn’t being applied. This could also be used for link monitoring to ensure that important links to your site stay live! Using the CheckBacklink function you can tell the tool to check a URL (in this example it is link location, cell C5) to see if this URL contains a link to your destination URL (in this example it is link destination, cell B5) with your expected anchor text (contents of cell D5). 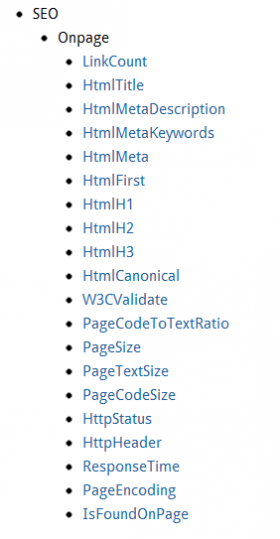 If the link is live on the page the tool will return Ok.
Pairing this baby with Screaming Frog, Xenu or IIS will make you a much more efficient SEO and remove reliance on slower third party tools. Having a number of ways to perform the same task can be extremely helpful if one solution is no longer viable. -Grab Whois information for a domain including expiration dates and even domain age using the DomainAge and WhoIsDomainExpires functions. Recent updates to the tool have also included the addition of Google Analytics and there are some great examples of how the tool can be used on Niels website from various bloggers which include gems like the inclusion of SEOMoz API data and how to identify lost links. 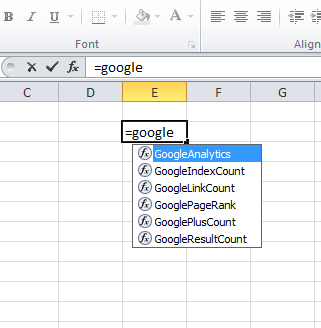 Richard Baxter from SEOgadget has also written a great post about the SEOTools for Excel which runs through some of the main functions. While these tools may be useful to some they should be used with caution as things can change rapidly. Also it is important to note that SeoTools for Excel uses your IP address so you will need to be careful about the amount of requests you make to websites. If you have put together any tools with SeoTools for Excel which you think other SEO’s may find useful please let people know in the comments.